Baku's Metro will change its appearance in the coming years and will make new stations based on the most modern technologies. Spokesman of Baku Metro, Nasimi Pashayev said new stations are designed for trains consisting of 7 cars. The new stations' platforms would be 144m making the platforms 42 cm longer than pervious ones. The new stations would be equipped with modern platforms, lobbies, escalators as well as new signaling and control systems. In this regard, a memorandum of understanding has already been signed with French companies, Alstom Transport SA, Bouygues Travaux Publics and THALES SA. Alstom Transport SA will provide Baku Metro with modern cars. Bouygues Travaux Publics will carry out the reconstruction project of the station 28 May, as well as other stations. THALES SA will install the latest signaling and control systems on the Purple line. Baku Metro also plans to invite French specialists to share their experiences with their Azerbaijani counterparts. Earlier, Baku Metro revealed plans to completely renovate its car fleet by replacing the current one. The lifetime of the cars has already expired. After the renovation of cars, the old rails would also be modernized. New stations will also have some elevators designed for disabled people. 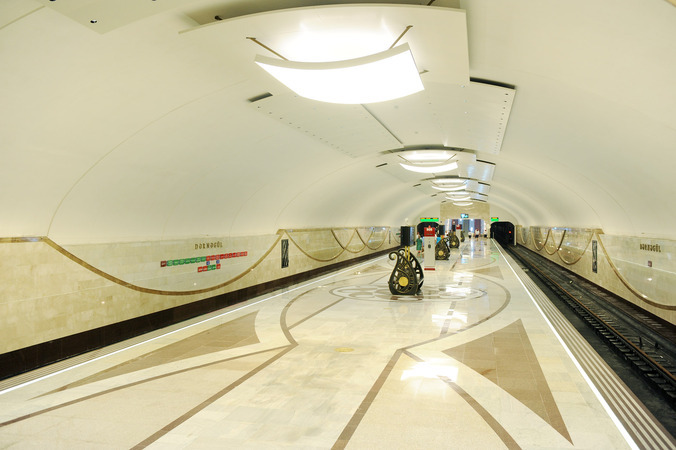 The subway system is developing rapidly in the Azerbaijani capital. Baku Metro with a length of thirty-five kilometers has two lines and 23 stations. It is planned to get enlarged to 119km with five lines and up to 76 stations by 2030. Currently, eight stations and two train depots are under construction. Some subways are also planned to be opened in the most populated and developed cities of the country, including Sumgayit, Nakhchivan and Ganja.